A sign in the window announcing the impending arrival of Little Manila, has appeared in the storefront formerly housing Confetti’s Creamery (and before that Carvel) in Bergenfield along Washington Avenue (just south of Main Street). Bergenfield is already known by many as the “Little Manila” of Bergen County, due to it’s high population of Filipino residents (according to Wikipedia, 22% of the entire county’s 14k+). 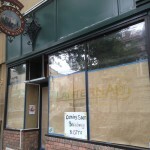 There is no other information at this time, including chef, opening date or menu.